A father-of-four murdered his wife then hanged himself weeks after an anonymous note revealing his wife was having an affair was pushed through the family home's front door, an inquest heard today. 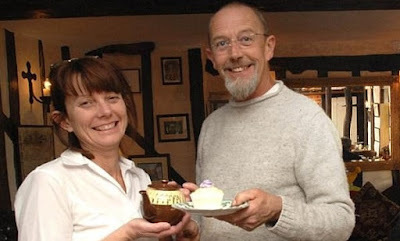 Richard Pitkin, 65, stabbed his wife Sarah, 58, in the neck then took his own life at the house they shared in Stowmarket, Suffolk, where they also opened a tea room together. They had been married for 37 years and had four children together but Mrs Pitkin was having an affair with a local man for several months, the inquest in Ipswich was told. The couple had 'grown apart' and Pitkin's wife had decided to move out and live with her mother when her infidelity was revealed in the anonymous note delivered weeks before her death. Pitkin told their son Tommy to 'make himself scarce' on February 26 this year so they could discuss their finances now they were separated. But their son returned to find the front door barricaded and called the police who found two bodies in a bedroom and a note. Today Suffolk's senior coroner Dr Peter Dean concluded that charity shop deputy manager Mrs Pitkin was killed unlawfully and carpenter Mr Pitkin's death was suicide. Det Supt David Cutler of Suffolk Police told the hearing in Ipswich that the couple 'appeared to have a normal, loving marriage'. He added: 'There is some indication that there were difficulties in the relationship, but there are no police records of any incidents between Sarah and Richard, known to the police. 'In late January, an anonymous note was delivered through the family door alleging that Sarah was having an affair with a local man.